Bring a large pot of salted water to a boil for pasta. 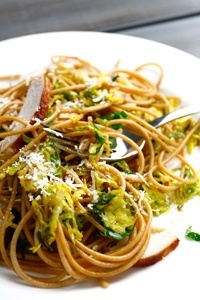 Shred Brussels sprouts with a grater into long, thin slices. Heat butter and 2 tablespoons of olive oil in a large saucepan over medium heat. Once butter is melted, add sprouts, garlic and a pinch of sea salt. Cook together for about 5 minutes, stirring often until sprouts begin to turn golden brown. Add chicken broth and continue to cook covered, stirring occasionally, for another 10 minutes until sprouts are tender. Cook pasta for al dente texture, according to package instructions, reserving 1/2 cup of pasta water. Add hot pasta to the saucepan and toss with sprouts, chicken, 3/4 cup of Parmigiano and 1/2 cup of pasta cooking water if needed. Cook together on medium heat for another 2 minutes to marry flavors.